Wings Food’s Golda Coffee Dolce Latte launched in early 2018 appears to follow the low-price strategy of the company’s Isoplus isotonic drink. The price of Isopus (350ml) has been kept at IDR 3,000 (USD 0.21) since its was first launched in 2016. 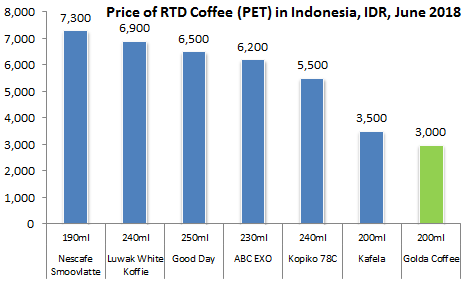 The new Golda Coffee Dolce Latte carries the same price tag of IDR 3,000. Golda Coffee is made from Brazilian coffee (without specifying whether it is robusta or arabica), low acid (go easy on the stomach) and Belgian milk to create an affordable but indulgent RTD coffee drink.